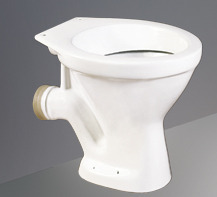 We are manufacturing and exporting a wide assortment of Sanitary Wares. The range offered by us includes Bathroom Sanitary Wares, Wall Mounted Wash Basins, Wash Basin with Pedestals and Designer Wash Basins. Furthermore, we also bring forth for our customers an exclusive range of Bath Tubs, Flushing Cisterns and Water Closet Commodes. These are manufactured using ceramics, which ensures durability and smooth finish. Owing to these features, our products are demanded in various parts of the world. We are backed by a team of dexterous professionals, which has years of experience in this domain. The professionals recruited by us ensure that all the products are manufactured as per the international quality standards. Further, they work in close consort as a unit to meet the urgent and bulk needs of the clients. We offer clients various payment modes and ensure that the products supplied to them are free from any kind of defect. Moreover, for timely delivery of the products, we have developed a widespread distribution network.